Late US senator John McCain took a final swipe at Donald Trump in his farewell message to the nation delivered posthumously Monday, denouncing "tribal rivalries," as an aide confirmed the president will not attend the lawmaker's funeral. On Monday, McCain offered his final thoughts, in a message read by his former campaign manager Rick Davis -- and he did not spare the Republican president. "We weaken our greatness when we confuse our patriotism with tribal rivalries that have sown resentment and hatred and violence in all the corners of the globe," McCain said in the statement. "We weaken it when we hide behind walls, rather than tear them down, when we doubt the power of our ideals, rather than trust them to be the great force for change they have always been," he added -- an apparent reference to Trump's plans for a border wall. "I lived and died a proud American. We are citizens of the world's greatest republic, a nation of ideals, not blood and soil," the former prisoner of war, two-time Republican presidential candidate and titan of US politics said. That appeared to be a reference to Trump's "Make America Great Again" slogan. The longtime senator clashed repeatedly with Trump despite being from the same party, and the president -- who in 2016 famously dismissed McCain as "not a war hero" -- has paid scant tribute to the senator in the wake of his death. 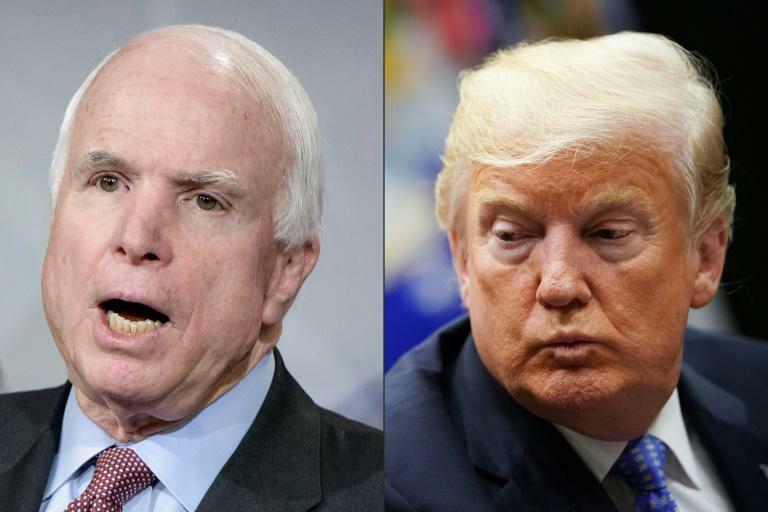 With bad blood between them at the boil, McCain reportedly excluded Trump from his funeral ceremonies -- a development that Davis confirmed on Monday. "The president will not be, as far as we know, attending the funeral. That's just a fact," Davis told a press briefing in Arizona.